Chris Brown is still in love with his ex-girlfriend Rihanna and Karrueche Tran is letting everyone know that she could care less. Last week Breezy was spotted singing Rihanna hit song “BBHMM” on stage while on tour in Asia. The “Ayo” singer is telling his people that he still loves Rihanna and digs her music. “I think Chris was lame to let RiRi go… I mean she is the baddest chick in the game right now, she is just killing it musically and in fashion so it’s no surprised that he is still in love with her, she is banging,” sources close to the singer said. Sources are also telling us that Karrueche Tran is making it clear that she doesn’t care if Chris Brown is still in love with Rihanna or even if they get back together because she is moving on with her life. 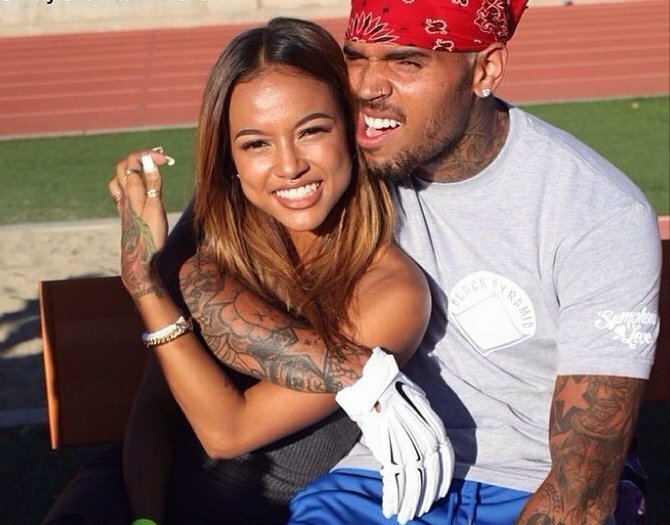 Sources also told us that Chris Brown is torn between Rihanna and Karrueche Tran but might end up with neither of them. “He is in love with both of them and would jump at the opportunity to get back together with anyone but there is a strong possibility that he might ended up with none of them and he only has his self to blame for how bitter they are against him,” sources told us. During an interview with Tim Westwood on Friday, Brown said that he respect Rihanna as an artist and always plays her song just like she always plays his music. I think Chris and Royalty look better.. And I think Riri feels the same.. Right now his focus should be solely on his daughter.. And getting his life together.. Royalty is priority.. He won’t get back with her. He cannot fathom the fact Drake fxcked her. That’s just adding to the fire. Oh please he went back with her the first time so you sound stupid. Also he has a scar on his chin from a bottle and karruche also got hit fighting for Rihanna. Rihanna and Chris Brown should just get back together and get it over and done with. Karrueche 15 minutes of fame is over. Lol. She is signed to one of the biggest acting agencies in the biz, and two of the biggest modeling agencies in the biz, not to mention her hosting work etc. Sorry to inform you. No way her agents are going to let her fail. He star is kinda skyrocketing right now. I don’t think that’s what she meant.. And in the end her fame is thanks to who?? And hey, Draya also got hers but at least I can actually rock with Draya.. Tran though everyone blaming I’m forgetting what she did.. Pst.. Not this one..
Rihanna might take him back but hes gotta work real hard to gain her trust. He should start a new relationship and learn from his past mistakes.